Dry skin—whether it’s hereditary, caused by the environment, or is the result of some not-so-great skincare products—may seem like it would be an easy fix, but that’s often not the case. You want emollient, hydrating ingredients to replenish skin, but you don’t want something that’s too slick or greasy. Natural ingredients can be amazingly helpful for dry skin, but you need to know which ones to look for—and which to avoid. In a way, dry skin sufferers are lucky: Nature has provided a wealth of options to help boost skin back to a hydrated, smooth, and supple look and feel. You can choose from a multitude of natural ingredients, including plant oils, plant extracts, and antioxidant compounds that occur naturally in plants, such as the EGCG found in green tea. All these help any type of dry skin improve and better defend itself from environmental aggressors. But, not all natural ingredients are great for dry skin. For example, so-called “essential oils” might sound as if they’re good for dry skin because they have “oil” in their name, but they also can contain numerous volatile fragrance components that can sensitize skin. As most people with dry skin know, aggravated skin makes dryness worse, not better. When searching for natural ingredients for dry skin, fragrance-free is always the best way to go. Non-fragrant plant oils, such as borage seed oil, argan oil, evening primrose oil, sunflower seed oil, and cranberry seed oil, are all amazing at soothing and revitalizing dry skin. As a bonus, they all have antioxidant properties as well, which means they can defend skin against the environmental assaults that can cause dry skin in the first place. Plant butters are another excellent choice to nourish and replenish dry skin. 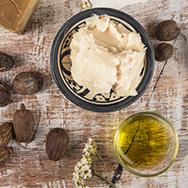 Seek out luxurious, rich butters such as shea butter, cocoa butter, and jojoba butter. These provide a heavy-duty dose of emollient benefits, and can help boost skin’s ability to prevent moisture loss. Holding on to moisture is key to stopping the cycle of dry skin. Last, but not least, there are a variety of skin-replenishing ingredients, such as ceramides, glycerin, cholesterol, and omega fatty acids, that can visibly strengthen and significantly soften dry skin so it looks revitalized rather than dull. Surprisingly, this doesn’t cover the entire spectrum of natural ingredients that are beneficial for dry skin—we just called out those that research has shown to be particularly impressive. Using skincare products that contain any of these natural ingredients, and avoiding naturally fragrant ingredients, is a great way to put you on the path to the smooth, supple skin you’ve always wanted! One final note: We love great natural ingredients that are proven to benefit dry skin, but we’d be remiss if we didn’t also mention that they can be even better when combined with great synthetic ingredients. This mix of ingredients from the natural and synthetic worlds creates luxurious textures and silky-smooth applications that make the most of what natural ingredients can do.